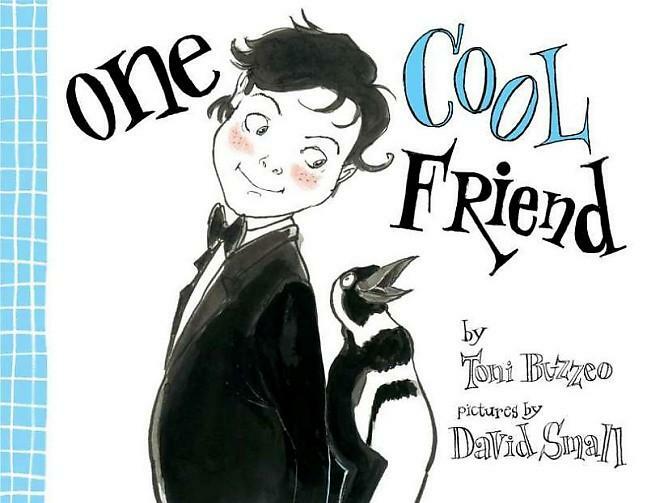 Dan, our BLG reader this week, brought us One Cool Friend written by Toni Buzzeo and illustrated by David Small. It was the first time all year that some of the students had seen a BLG book before (I had read this title (borrowed from our VP) to a group about 2 months ago). Well, this book really proved that some books truly improve with re-reading! First of all, Elliot, the main character of this delightful book, is one dapper young man. And we took note. We liked his tuxedo. His pink cheeks. The smattering of freckles. And his prance about shiny black shoes. And my, oh my, did he have polite manners. This is a boy to keep an eye on. 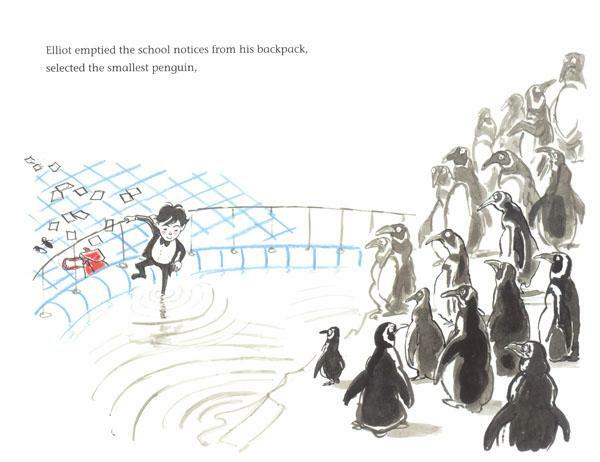 Keep an eye we did, as Elliot moved through the pages finding himself at the penguin display at the Aquarium where he was quite delighted to discover a number of penguins who looked quite a bit like him – proper in black and white with an air of importance. He decided that he needed a penguin of his own and his father obliviously agrees. So Elliot heads home from the Aquarium with his new friend Magellan the penguin in his backpack. How wonderful! Life with a penguin means adjusting your routines some. Air conditioners need to work at maximum power. Ice rinks need to be fashioned. Frozen seafood should be rationed! And the bathtub often needs to be a swimming pool for diving practice. When Elliot’s father discovers Magellan, Elliot discovers that his eccentric father has his own secrets! Please read and then reread this book. Many times. On the first run through one might miss how the clever illustrations hint at a very interesting ending. But it all begins to make sense when we notice these details. Like pj patterns. Colour schemes. Foot rests. A must own book! Khai: I like how Elliot was dressed like the penguins when he got him (from the Aquarium). Catriona: It’s very funny at the end when the father has a strange pet too! Truman: I like the book because the Dad really had a real tortoise and Elliot thought it was a fake! This entry was posted in BLG Reads this week and tagged BLG Reads, David Small, favourite illustrators, fiction, great read alouds, picture books, Toni Buzzeo by carriegelson. Bookmark the permalink.